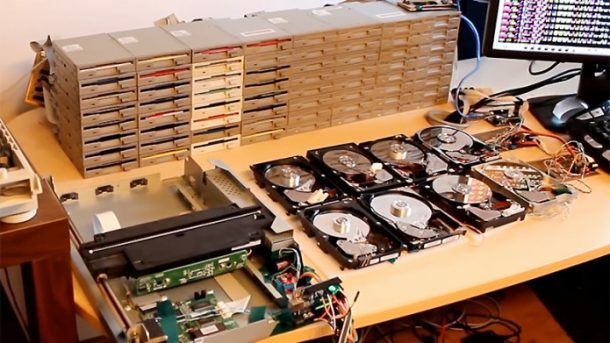 Pawel Zadroniak has been creating some classic tunes played on his Floppotron- a musical instrument designed using 64 floppy disc drives. His latest creation, the Ghostbuster theme song has just arrived in time for every nerd’s Halloween playlist. Of course, some of his creations are better than others. Zelda soundtrack, for example, is just fine. Sandstrom, Darude’s techno classic, when played on floppy drives might come off as a little too manic. The equipment can be heard struggling to keep up, and the constant thump is absent from the tune that makes you nod your head. However, Ray Parker Jr’s “Ghostbusters” has the sounds that only the old school floppy discs can do the best. The best thing about it is that it’s not too heavy on bass as well. Floppotron can also create the pitch-shifted theremin-style tones for giving the song its original spooky touch. Are you going to add a little Floppotron to your Halloween playlist this year? Give a listen to the track and let us know in the comments.